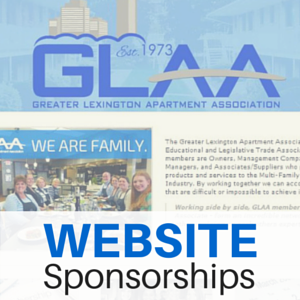 With this sponsorship, your company and full contact information, along with a link to your website, will be listed under the Members tab on the GLAA website. Need an example of how your listing would look? Associate Members are listed here. | Regular Members are listed here. $150 when paid with membership dues renewal in the beginning of the year or $250 when paid at a later date. With this sponsorship, your company will be prominently featured at the top of the GLAA Homepage with a banner sized 960x290 pixels that links directly to your company website so our website patrons can easily find you! For our Associate Members, this sponsorship is exclusive with only one vendor in each category represented. Banners will be rotated frequently to ensure every sponsor has a chance to be viewed equally. Don't have graphics available for this sponsorship? The GLAA staff can develop it for you at no additional cost! $600 per year and can be paid monthly, quarterly or yearly. Are you wondering if your company has the money to be a Website Sponsor? The GLAA website had over 800,000 views last year. The question should be - can you afford not to? My company wants to be a Website Sponsor! A Website Listing for our Company A Website Homepage Banner Sponsorship More information! Can you contact us?